ProCone supplies gasifiers for thermo-chemical conversion of solid feedstocks into usable synthetic gas (SynGas). Our high efficiency gasifier is the core piece of our technology. ProCone is focused on providing innovative conversion technologies for processes using the most efficient methods and technologies. ProCone supplies gasification systems for different applications in various sizes from 3 MW up to 60 MW chemical gas output per unit. The aim of the thermo-chemical conversion process (gasification) is to generate in a gasifier, a synthesis gas or a raw gas (SynGas) from the thermal conversation of biogenic solid materials (feedstock materials) such as wood, waste of any kind or coal. The calorific value of such SynGas is generally less than 8 MJ/m3. Byproducts of the process are ash (vitrified slag) and exhaust heat (heat loss and raw gas cooling). In addition to the feedstock, a gasification agent is required, which normally consists of air. Higher heating values of the gasifier can be achieved with the addition of enriched oxygen or with the addition of steam condensation. A typical process arrangement converting wood using air as the gasification agent, into SynGas, can be seen in the chart. The SynGas production, as well as the drying, pyrolysis and combustion, is a part of the process that takes place in any normal combustion. An ignition of the resulting gas is prevented by lack of oxygen, and by extrication of the gas from the gasifier. The important feature of the gasifier and essential difference from normal combustion, is the temporal and spatial separation achieved in the production of the gas, respectively the non-ignition of the gas and thereby the utilization of it. 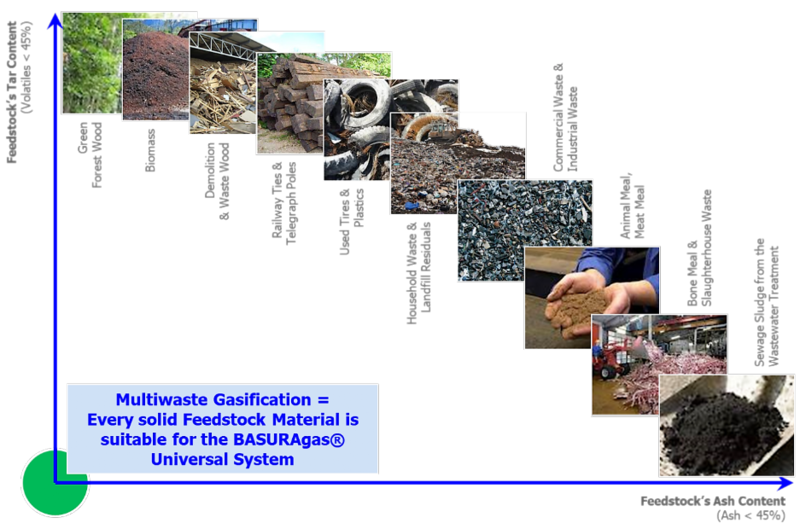 A selection of feedstock materials suitable for the BASURAgas® Universal System listed by tar and ash content.